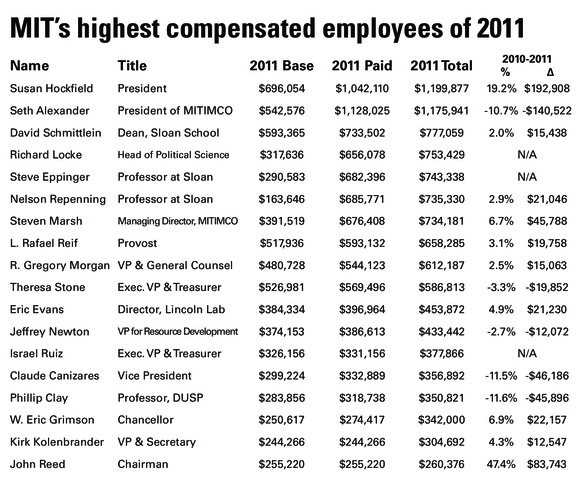 These data are for calendar year 2011, from Jan. 1, 2011 through Dec. 31, 2011, and comes from MIT’s IRS Form 990, the tax return for non-profits, which was filed May 15, 2013 for tax year 2012. “2011 Base” stands for “Base compensation,” which are “nondiscretionary payments to a person agreed upon in advance, contingent only on the payee’s performance of agreed-upon services (such as salary or fees),” from column B(i) of Schedule J Part II of the form. “2011 Paid” or “Paid compensation” is the “reportable compensation from the organization (W-2/1099-MISC)” column from Part VII Section A of the 990 OR the sum of the column B(i), B(ii), and B(iii) of Schedule J Part II of the form. “2011 Total” or “Total compensation” includes that as well as “retirement and other deferred compensation” and “nontaxable benefits” from column E of Schedule J Part II of the form. The percentage changes (% columns) and the differences (∆) are based on total compensation. 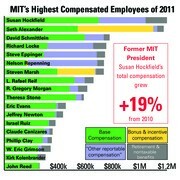 MIT Investment Management Company (MITIMCo) employees compensations do not include incentive compensation which “could have increased or decreased depending on the performance of the endowment” and are contingent on continued employment by MIT. Professors Locke, Repenning, and Eppinger appear because of their participation in the Sloan School of Management’s Executive Education program.